Vice President of the Governing Council, and Acting Secretary General, Confrère Matthew Jackson. As prescribed by the Constitutional Charter the newly elected Grand Master established the three juridical governing bodies of the Order; the Grand Magistral Council, the Constitutional Council and the Governing Council. These governing bodies were given the mandate to work together for the good of the whole Order. H.R.H Prince Charles-Philippe d Orléans, Duc d Anjou, Grand Prior of France. The Much Hon. Baron of Fetternear, H.E.Chev. Martin Thacker, Grand Prior of G.B. H.E. Chev. Charles Beke, Grand Prior of the Netherlands. H.E. Chev. Giovanni Ferrara, Grand Prior of Italy. Chev. Bailliff Ondrej Vanke, Acting Head of Jurisdiction of Bohemia. Chev. Rolf Leenhoust, Commander and Head of Jurisdiction of Spain. Chev. Bailliff M.A. Huot, Acting Head of Jurisdiction of France. Chev. Thierry Pauquet de Villejust, Commander and Head of Jurisdiction of USA. 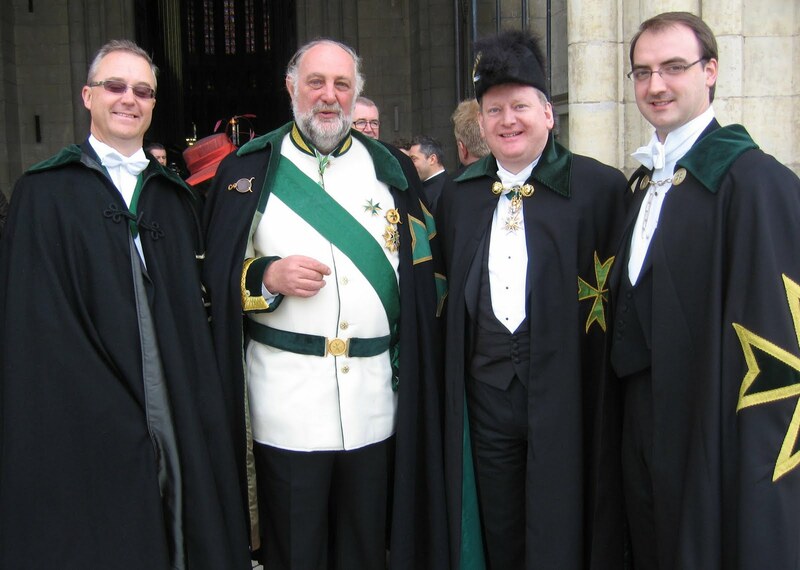 The members of the Grand Priory of Great Britain are delighted that three of our number have been asked to serve the Order at the highest level and are extremely pleased with the direction that the new Grand Master is taking in insisting that all members must involve themselves in communication and decision making. Indeed he assured us in his opening address that "I, and my officers, will never forget that we are elected by the membership." These new appointments and new structures should ensure that there will be no return to the "greed, personal ambition and the conflict of interest so devastating to our reputation in the past". The future looks very bright indeed.